Despite the huge fire which engulfed the Robinsons Store on September 19th, our award-winning Mail Order Service is continuing to operate as usual. Our Call Centre and main warehouse are actually located five miles away from where the Store used to be and at 74,000 square feet, we have ample facilities to enable us to take up to 3,000 orders each day! Even with the temporary loss of our Store, we are still the UK's largest equestrian provider with huge stock levels. At 220-pages, our 2002/03 Annual Catalogue is our biggest ever and is jam-packed with some superb products for your horse, your home, your stable...and you! As well as all the old favourites, there are plenty of new innovative ideas, great new brands and of course the usual amazing prices. Within twenty-one days of our Retail Store burning to the ground, we had located temporary premises within two miles of our old location and filled it with horse feed, bedding and supplements. Since the fire at our Store we'd been inundated with calls from regular Feedstore customers enquiring as to when they'd be able to purchase their horse feed and shavings from us again. Many stated that they were finding it extremely difficult to locate an alternative local supplier that offered the same wide range of low-priced feed. Our temporary Feedstore offers the same ranges, at the same great prices with the same efficient service - plus it's bigger than the original! We've now been open for more than a fortnight and it's great to see that so many of our regular Warrington Road Feedstore customers are coming back to us at our new site on Haydock Lane (see page 4 for address). There have also been a few 'new' faces spotted, so our local advertising campaign must be working well! Since the fire at our Retail Store, we've been regularly updating our website with the latest information regarding our plans for a new Retail Store and the opening of our new temporary Feedstore. 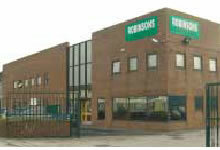 Plus, when you visit www.robinsons-uk.com you'll discover a whole new world of equestrian online shopping. You'll find all the products from our catalogues, plus many more available to purchase through our website. Browsing through you'll also find general information about the history of Robinsons, the services we offer, job vacancies, 'web only' offers, a constantly updated 'links' page and a step-by-step guide on how to place an order online. In an effort to inform those Store customers who do not have access to the Internet, we've been inserting copies of 'Newsletters' into every parcel that leaves our warehouse, we've placed advertisements in all the local and national 'equestrian-related' press, plus we've produced an advertising campaign that can be heard on WISH FM, a local radio station. Some of the questions we've been asked most frequently since the fire at our store have been about when and where we would re-build. With the loss of our old store, we have a unique opportunity to design and build a new one to our own specifications. Our store staff are quite familiar with the frustrations of occupying a forty year old building and the restrictions it imposes. Now we can remove all these frustrations, enabling us to give you a much better store and a much better service. Already, plans for the new Store have been sketched and sent to the appropriate official departments for approval and feedback. Hopefully it won't be long until we can make these plans public - all we can say until hen, is that we guarantee a trip to our new store will definitely be worth the ride! 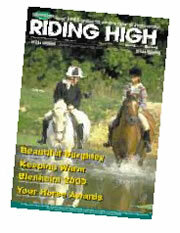 The very first issue of 'Riding High' was produced in March 2001 and since then, it has been written, produced and designed in-house by our Marketing and Design team. Each month, the magazine has been distributed to an average of 25,000 individual readers and the responses have been very favourable. The decision to upgrade the magazine and increase its size was made and the new bi-monthly magazine was due to be launched in September. However, the Retail Store fire altered our priorities and the 'Riding High' launch date was postponed until the middle of November. It is estimated that with a readership of over 50,000 readers, 'Riding High' will be positioned as the third largest equestrian magazine on the UK market. 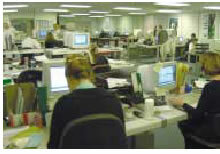 It will contain features, product launches, special offers and competitions, as well as adverts and advertorials. As usual our new-look magazine will be distributed into every parcel that leaves our warehouse and each issue will run for two months. To receive your copy simply place an order, or pick up a copy from our trade stand which can be found at any of the numerous equestrian events that we attend throughout the year.